A 3.28 multi-use trail providing separate paths for pedestrians and cyclists. The bike trail is asphalt and walking/ jogging trail is natural with soil cement additive. Location: At Westgate Memorial Park in Dothan, AL. From Montgomery, take Hwy 231, turn right onto Westgate Parkway. Turn right onto Whatley Drive. Take second left onto Deerpath Road. Located on the perimeter of the 243 acre Westgate Memorial Park, The Larry and Ronna Dykes Trail consists of two 3.28 mile trails: one for pedestrians and one for cyclists. Each trail is 9 feet in width. However, the trails also include short well marked combined areas where cyclists and pedestrians share the trail. These sections are 12 feet in width, and total less than 1 mile. The bicycle trail is asphalt and the walking/ jogging trail is natural earth fortified with a polymer soil cement, for erosion control. All trail signs are taken from the Federal Highway Administration Manual on Uniform Traffic Control Devices under the section on “Bicycle and Pedestrian” facilities. The trail also features a connected ½ mile asphalt loop, called Kiwanis Trail, which is handicap accessible and fully lighted for evening enjoyment. All three trails are served by a user friendly trail head with a 30'x 60' pavilion featuring restrooms and water fountains for people and pets. The trail head also features a paved 80 car parking lot and playground. A trail map sign marks the start and finish of the pedestrian and bicycle loops, and trail markers demarcate distances at 1/2 mile intervals. The bicycle trail is marked for one way traffic only, and the walking/jogging trail is designed for pedestrians to walk/jog either direction. All trails traverse peaceful wooded areas featuring a combination of native hardwoods and southern pines, with approximately half of the trail mileage passing through open “active park” areas. The design of the multi-use trail encourages family participation with appropriate areas for strollers and tricycles at Kiwanis Trail, and the opportunity to share family experiences biking or hiking on the 3.28 mile trails. The Larry and Ronna Dykes Trail was the original site of Dothan's first airport. 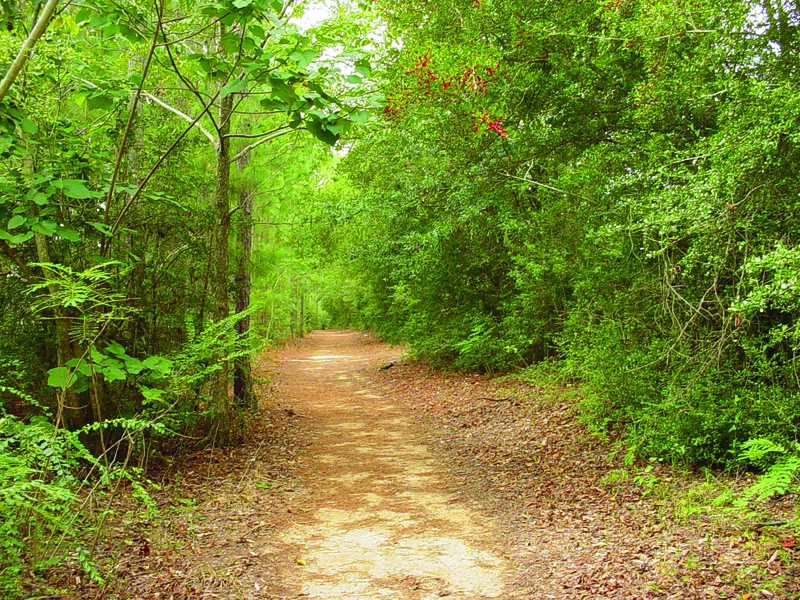 Named after the founders and longtime president (Larry) of the Dothan Runners' Club, the trail was a natural surface pedestrian trail for over 20 years. Unfortunately, it had constant maintenance issues such as erosion and root intrusion. The trail never appealed to cyclists. Since its renovation in 2010 it has averaged around 400 users per day, determined by an electronic trail counter, making it one of Dothan's most popular recreation facilities. Cycling and walking/jogging are equally popular. Because the park is surrounded by neighborhoods it is an easy walk or bike ride from many residents' homes. The trail was built primarily by the Dothan Public Works Department having been funded by public and private grants. The trail is maintained and managed by the Dothan Department of Leisure Services. Also purchased through the grants, a “Buffalo Turbine” is being utilized to keep the trails in great shape. This oversized pull-behind blower handles most routine maintenance, with an average of 2 hours invested weekly. Trash pick up can be handled simultaneously. For larger jobs, The Public Works Department is still available. The renovated trail has already hosted several running events through the Dothan Runners Club, and an annual bicycling event has been established: the Mayor's Ride for Fitness. The Mayor's Ride is an outdoor fitness fair where children collect fitness related gifts from vendors, learn about bike safety, and join the mayor in riding the trail. The first year drew 200 children to participate. Photo by Dothan Leisure Services. I wrote about being bitten by a dog in a review for this site. I have to give credit to the City of Dothan and Mr. Meeker. I field out an injury report noting the dog bite event on the trail. Mr. Meeker contacted me with lots of concern and took action. within a couple of weeks the trail is clearly marked with signage of what type of leash is acceptable. The word is out and the dogs are under control. This makes this trail a very safe and enjoyable experience for all. This is a great place to run, walk, or bike. AND thank you dog owners. The Westgate Trails are awesome including the entire park! Great employees who keep it maintained and safe. I use it regularly. There is a difference between a leash and a tether leash. I was running this past Saturday, came around a turn and met two dogs on a long tether. The owner could not pull the dogs back before one bite me in the leg. The bite drew blood in 4 different places and will be sore for a few days. Be careful out there running. Dog walkers, please keep your dogs on a short leash. Dogs are dogs and are going to protect themselves when startled. Your dogs ruined a great day. Over the years I have done many 5K races on this trail. I also do conditioning hikes, with my backpack when I'm getting ready for a long distance hike on the AT, PCT or CDT. Again it's a great trail. I have done many 5K races on this trail and used it for conditioning hikes for my long distance hikes. It's a GREAT TRAIL!